All of the ingredients in this salad are highly nutritious and it is super tasty. 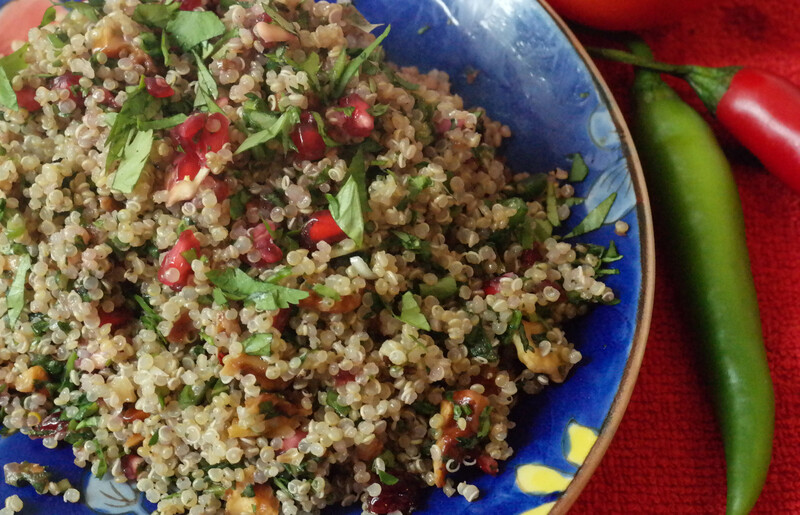 I am impressed with the versatility of quinoa and it is so easy to prepare. Walnuts, pomegranates and cranberries are all great foods for the Autumn. This dish is a complete meal but and it could also be served with a casserole when you want to impress or inside a wrap with some baba ghanoush as a snack. Rinse the quinoa in cold water. Place in a pan with enough water to cover the quinoa plus 2cm. Bring to the boil and turn to a simmer. Cover with a lid and cook for about 7 minutes until the quinoa is half cooked. Turn off the heat and leave for another 5 minutes till all of the water has been absorbed. Leave to cool. Place the cooled quinoa and all of the other ingredients in a large bowl and combine. Next Article No Colds or Flu all Winter? Yum this looks delicious, great idea to put walnuts in!